God Reveals - Outer Darkness! Then during another meeting on 8-2-2009, I reported that the Lord said, “I’m going to teach you something man’s not known.” We knew we could not bring it about, but we had plenty of expectancy. It is my hope that the testimonies in this article will inspire you to step into having Golden Meetings. It is well worth learning; but you must have hands-on experience to understand fully, like in a boot camp situation. It can take some time to do this. As you know from reading previous information about the Parable of the Marriage Feast of the Lamb, the Lord has demonstrated to us the different elements of the parable. We have walked them out and come to understand them, so that they are ingrained in us. As a short review, we came to understand that the parable is a picture of a Kingdom meeting with the Lord running the meeting all the way through. We understood that there are many more guests than the number of people comprising the Bride. The Bride is a body fitly joined together as one person, the guests are not. We realized the Bride is intimate with the Lord, the guests are not. We came to understand what corporate intimacy is by experiencing what the Lord was teaching us. In that article I revealed that the Lord confirmed the removal of that improperly dressed person in a special way so we would know for sure what we had done was of Him. After learning “why,” I figured we had the whole picture and never thought to even look at and cast him into outer darkness, there shall be weeping and gnashing of teeth part of the scripture. 11 And when the king came in to see the guests, he saw there a man which had not on a wedding garment: 12 And he said to him, Friend, how came you in here not having a wedding garment? And he was speechless. 13 Then said the king to the servants, Bind him hand and foot, and take him away, and cast him into outer darkness, there shall be weeping and gnashing of teeth. As the Lord started dealing with me about the removal of a person and this part of the scripture, I was reminded that I understand what the gnashing of teeth is because I had experienced it years ago. I gnashed my teeth when I finally accepted the truth of what God had shown me concerning eternal salvation. When I did this, in a flash, I saw the truth of all the untruth surrounding the false doctrines of man. I actually gnashed my teeth in the physical. The core of it was that the truth was so simple, yet I had been refusing to accept it. After the Lord brought this up I got to thinking and realized that the improperly dressed person which the Lord had us remove had not lost their eternal salvation. They had just refused to maintain being rid of the three spots. I was thinking about some of what this person had missed by not being in the meetings and not being in the Light of the Lord. Then it hit me that outer darkness was the absence of the Light of the meeting. Simple! I became excited at what the Lord was revealing. I decided to poll some people that I know have had Golden Meetings for more than a year. 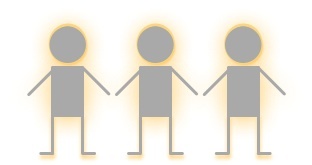 I asked them how much more Light is there in a Golden Meeting than in the meetings they used to attend. Then I said to rate it between 0 and 100%. I found that to be a mistake. One lady wrote back saying 100%, but that she wanted to say 1000% and that I had limited her to 100%. It was then that I said, “Lord, there is no scripture for all of this,” and the Lord replied, “I am Light!” With that I thought, “I should have been able to see this a long time ago, it’s been right in front of me.” I also realized this is why I saw so much Light coming from the base of the Holy of Holies when the Lord was teaching us about meeting in Him. Knowing that we meet in Jesus just like the priests did in the temple, and that He is Light, I understood there is no limit to the Light in a meeting. The parable carries a message so we can get it correct. Outer darkness is not about going to hell; it’s about separation from the light of God. The parable shows us what we are missing by not holding or being in Kingdom Meetings and letting our King rule. And cast you the unprofitable servant into outer darkness: there shall be weeping and gnashing of teeth. I had gone back to sleep after having the scene of the three illuminated men. I was given a long, somewhat detailed dream with a friend of mine in it. I’m not going to share the dream in its entirety because of its length, but I will pick out parts that are important. The dream was given so we can understand the picture of what the King’s friend, who was not dressed correctly, did wrong to get cast out of the Marriage Feast. God has already revealed in the meetings section and the Marriage Feast section of this site that a person must be rid of the three main spots to be in the Golden Meetings or the Marriage Feast meeting as a guest. This scene in the night goes deeper into the root cause of the King’s friend not getting rid of the three spots. In the scene my friend and I were harvesting a field of soybeans. He had his combine and I had mine. The field contained a very good crop. Soybeans have oil in them, so from our flow chart I know that the crop has to do with the Holy Spirit and the River of Life that flows from God. So symbolically we were harvesting the “things of the Spirit” that come down the River of Life. We were receiving the Word of the Lord down the River of Life and His Word is seed to us. This seed can be educational or instructional. In the scene my friend unloaded his John Deere combine onto his pickup. I went over to his pickup and saw that there were no soybean seeds in his load, but that it was filled with ground up weeds. He had harvested tares, so-to-speak. I went over to his combine and looked at the sieves in his combine and they were wide open, letting the tares through. The Parable of the Wheat and the Tares reveals that the enemy comes and plants tares (weed seeds - thoughts) in with the good seed (thoughts) planted in us by the Lord. Having farmed, I experienced that when we planted any kind of a seed we always had to contend with weeds coming up in a crop. Another parable put he forth unto them, saying, The kingdom of heaven is likened unto a man which sowed good seed (thoughts) in his field: But while men slept (meaning being unaware that it is the enemy), his enemy came and sowed tares (thoughts) among the wheat, and went his way. But when the blade was sprung up, and brought forth fruit, then appeared the tares also. To apply this picture to the previous scene, my friend had not done what the Lord had said to do concerning what comes down the River of Life. Knowing that the King’s friend in the Parable of the Marriage Feast is what this is all about, we can see the friend of the King did not get rid of the three spots as the Lord had revealed. He had instead listened to the tares or thoughts of the enemy of mankind. Maybe thoughts of - I don’t have time - I know and have heard the Lord - I’m all right - It’ll be alright, etc. He might also have let the cares of this world overtake him. In the scene my friend went to another farmstead and I went with him. He wanted to cut beans for another farmer who was a relative. We went into the house there and my friend wanted a statue-looking thing that held a cigarette. It had belonged to a deceased relative. There is a good chance that this statue represents an idol. I don’t know this, but we as a people seem to want to hang onto the ways we have been doing things. This can be an idol, a pet. When one enters into a Kingdom Meeting with the Lord being the head, this can not exist. All we are to do is to pay attention to the boundaries the Lord has established so we can find Him. Remember, the Lord said dreams are allegories. What’s the message? It is obvious that the Holy Spirit revealed through this scene that the friend of the King in the Parable of the Marriage Feast was simply doing what he wanted to and had not become disciplined to the Lord. He had not learned that God is speaking to us today, guiding us toward spotlessness. The friend’s lack of knowledge on how to set the sieves in his combine reveals he was obviously unaware of the enemy’s tares or thoughts given to Him and throughout the Body of Christ. He obviously had not learned what the bottom spot is, which is the mechanics of how the Holy Spirit leads and teaches. I mentioned before in an apostle’s meeting the Lord called the apostles “friends.” This certainly lends to the total picture. The Lord wants guests at His wedding feast. Guests go beyond being friends and what a friend does.